The domain within your query sequence starts at position 1059 and ends at position 1229; the E-value for the MAGE domain shown below is 6.82e-65. The MAGE (melanoma antigen-encoding gene) family are expressed in a wide variety of tumors but not in normal cells, with the exception of the male germ cells, placenta, and, possibly, cells of the developing embryo. The cellular function of this family is unknown. This family also contains the yeast protein, Nse3. 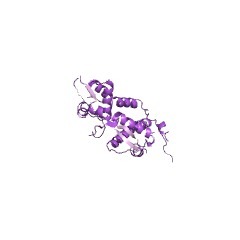 The Nse3 protein is part of the Smc5-6 complex (PMID:15601840, 15331764). Nse3 has been demonstrated to be important for (PMID:15331764). The first mammalian members of the MAGE (melanoma-associated antigen) gene family were originally described as completely silent in normal adult tissues, with the exception of male germ cells and, for some of them, placenta. By contrast, these genes were expressed in various kinds of tumors. However, other members of the family were recently found to be expressed in normal cells, indicating that the family is larger and more disparate than initially expected. MAGE-like genes have also been identified in non-mammalian species, including Drosophila melanogaster (Fruit fly) and Danio rerio (Zebrafish). Although no MAGE homologous sequences have been identified in Caenorhabditis elegans, Saccharomyces cerevisiae (Baker's yeast) or Schizosaccharomyces pombe (Fission yeast), MAGE sequences have been found in several vegetal species, including Arabidopsis thaliana (Mouse-ear cress) [(PUBMED:11454705)]. The only region of homology shared by all of the members of the family is a stretch of about 200 amino acids which has been named the MAGE homology domain. 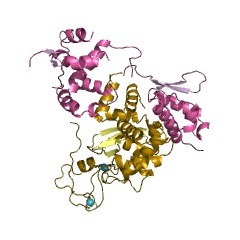 The MAGE homology domain is usually located close to the C-terminal, although it can also be found in a more central position in some proteins. The MAGE homology domain is generally present as a single copy but it is duplicated in some proteins. It has been proposed that the MAGE homology domain of MAGE-D proteins might interact with p75 neurotrophin or related receptors [(PUBMED:11454705)]. There are 6200 MAGE domains in 5936 proteins in SMART's nrdb database. Taxonomic distribution of proteins containing MAGE domain. This tree includes only several representative species. The complete taxonomic breakdown of all proteins with MAGE domain is also avaliable. Click on the protein counts, or double click on taxonomic names to display all proteins containing MAGE domain in the selected taxonomic class. Composition and architecture of the Schizosaccharomyces pombe Rad18 (Smc5-6)complex. The rad18 gene of Schizosaccharomyces pombe is an essential gene that is involvedin several different DNA repair processes. 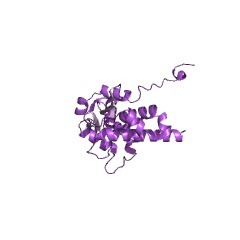 Rad18 (Smc6) is a member of thestructural maintenance of chromosomes (SMC) family and, together with its SMCpartner Spr18 (Smc5), forms the core of a high-molecular-weight complex. We show here that both S. pombe and human Smc5 and -6 interact through their hingedomains and that four independent temperature-sensitive mutants of Rad18 (Smc6)are all mutated at the same glycine residue in the hinge region. This mutationabolishes the interactions between the hinge regions of Rad18 (Smc6) and Spr18(Smc5), as does mutation of a conserved glycine in the hinge region of Spr18(Smc5). We purified the Smc5-6 complex from S. pombe and identified four non-SMC components, Nse1, Nse2, Nse3, and Rad62. Nse3 is a novel protein which is relatedto the mammalian MAGE protein family, many members of which are specificallyexpressed in cancer tissue. In initial steps to understand the architecture ofthe complex, we identified two subcomplexes containing Rad18-Spr18-Nse2 andNse1-Nse3-Rad62. 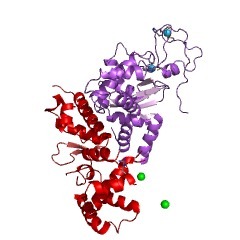 The subcomplexes are probably bridged by a weaker interactionbetween Nse2 and Nse3. Nse1, Nse2, and a novel subunit of the Smc5-Smc6 complex, Nse3, play a crucialrole in meiosis. The structural maintenance of chromosomes (SMC) family of proteins play key rolesin the organization, packaging, and repair of chromosomes. Cohesin (Smc1+3) holdsreplicated sister chromatids together until mitosis, condensin (Smc2+4) acts inchromosome condensation, and Smc5+6 performs currently enigmatic roles in DNArepair and chromatin structure. The SMC heterodimers must associate with non-SMC subunits to perform their functions. Using both biochemical and genetic methods, we have isolated a novel subunit of the Smc5+6 complex, Nse3. Nse3 is anessential nuclear protein that is required for normal mitotic chromosomesegregation and cellular resistance to a number of genotoxic agents. Epistasiswith Rhp51 (Rad51) suggests that like Smc5+6, Nse3 functions in the homologousrecombination based repair of DNA damage. We previously identified two non-SMCsubunits of Smc5+6 called Nse1 and Nse2. Analysis of nse1-1, nse2-1, and nse3-1mutants demonstrates that they are crucial for meiosis. The Nse1 mutant displays meiotic DNA segregation and homologous recombination defects. Spore viability is reduced by nse2-1 and nse3-1, without affecting interhomolog recombination.Finally, genetic interactions shared by the nse mutants suggest that the Smc5+6complex is important for replication fork stability.